There were no broken bones, yet he couldn’t fly. He was eating on his own, yet he wasn’t gaining any weight. Nothing seemed to fit with this Great Egret – until we felt his abdomen. There we found a round, unmistakable lump. Great Egrets (Ardea alba) are summer visitors to New York, and can be seen wading in fresh-water lakes, salt-water marshes, canals and even ditches all around the city. 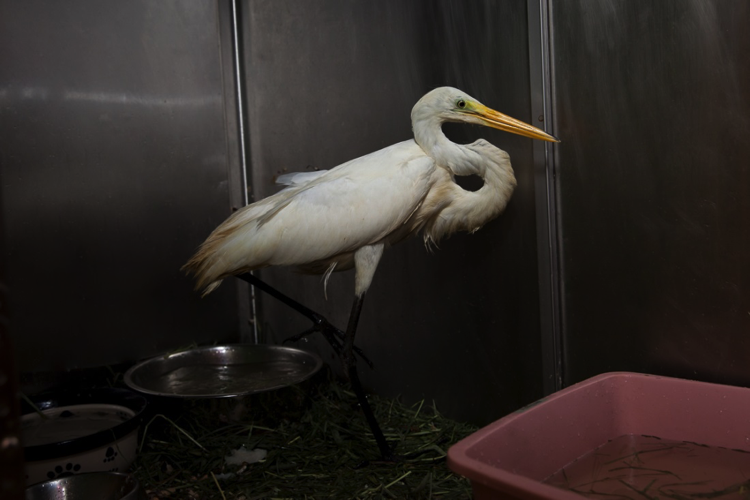 Because they hunt in shallow water, egrets and other waterbirds often arrive at the Wild Bird Fund Rehabilitation Center in Manhattan after having eaten old fishing lures, hooks, and sometimes entangled in fishing wire. We couldn’t be sure what the Egret had swallowed until he went through surgery. Dr. Pilny from the Center for Avian and Exotic Medicine lead the surgery and removed the lump from our patient. What we thought had been something he swallowed, was actually a parasitic infection that the Egret was trying to fight. It was the infection that was causing him to lose weight, and at almost 35% of his body weight, it had not only been starving him, but had made him too heavy to fly. Once the infection had been removed, he immediately began to put on weight and was soon able to start flying again. Great Egrets are slow, powerful fliers, flapping only twice per second. They use their large wingspan to soar and travel vast distances, wintering as far South as Cape Horn. To prepare him for his migration back South, we sent our patient to the Raptor Trust to get some flight time and build up his strength. We are thrilled to report that our Great Egret patient made a full recovery. Even now he is on his way to enjoy the sunshine of South America with significantly more flying muscles and a noticeably slimmer waistline.